We can all agree that Guadalquivir is the most important thing about the city because if it was not for the river we would not be here, it is the spine of Sevilla. Guadalquivir is the 5th longest river in Spain, it is 657kms long, its source is located in Sierra de Cazorla (Jaén) and its mouth is in San Lúcar de Barrameda (Cádiz). During the VI century, for the greek sailors that came to the city by the river, its name was Tharsis, referring to the Kingdom of Thartessos, however, for the citizens here it was already being known as Baetis or Betis even before the Romans got here. The arabs were really respectfull when it came to not changing the name of cities or rivers after their conquest, however, the actual name comes from the arab “ الوادي الكبير – al-wādi al-kabīr” literally “the big river”, it has been called like this since the XI century. As the Guadalquivir is the only inland port in the Peninsula, the commerce around its area has always been very important, we have always been great importers of olive oil, wheat, honey, wine, wax, tin, and a long etcetera. 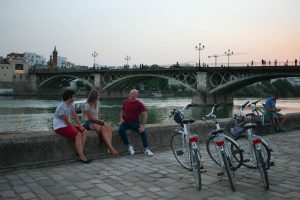 Nowadays, both sides of the river have the facilities to enjoy the Guadalquivir to the fullest. 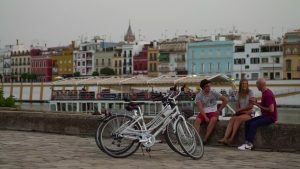 We have parks and cycle lanes so everyone that’s into sports, walks their dogs or just likes to have fun by riding a bike has found their perfect spot right there, in the heart of Sevilla. 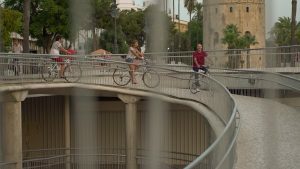 With our Daily Bike Tour we get to cover a lot of space in both sides of the river following the bike lanes and imagining how it was by enjoying what it has become.